Community Health Systems and its Fort Wayne, Ind., subsidiary, Lutheran Health Network, are suing Lutheran's former CEO for allegedly breaching his contract by using confidential information to lure competitor Indiana University Health to the Fort Wayne area. Lutheran Health Network and CHS filed a complaint Thursday in the Circuit Court for Williamson County, Tenn., against former CEO Brian Bauer and five unnamed defendants for disparaging the health system, claiming that Bauer "made good on ongoing threats" to harm the hospital group after it refused to sell its eight hospitals for less than market value. Franklin, Tenn.-based CHS declined to comment beyond what was included in the complaint. Bauer was fired as the Lutheran Health Network's CEO in June in the wake of a failed physician bid to find a buyer for the Fort Wayne hospitals. Then, late last month, IU Health said that Bauer and former Lutheran Hospital Chief Medical Officer Dr. Geoffrey Randolph signed on to help build a new primary-care practice in Fort Wayne. Bauer is an independent contractor working with IU Health to build out the primary-care practice. A Lutheran Health Network spokesman at the time said he expected the health system's long-standing history of collaborating with IU Health to continue. In a conference call this week to discuss third-quarter earnings, CHS CEO Wayne Smith dismissed the IU Health competition, saying it wouldn't have material impact on CHS. "There is a lot of distraction in market, but we fully intend to protect our assets, our reputation and joint venture partners in their investments going forward," Smith said, adding that CHS is hiring more physicians, has a stable workforce and is "doing all the right things" in Fort Wayne. In the complaint, Lutheran Health Network and CHS claim Bauer and the five unnamed defendants are out to get them by "executing a long-planned scheme to interfere with plaintiffs' business and to drive them from the Fort Wayne market for the purpose of the defendants' own private economic interests." Lutheran Health Network labeled Bauer's move to help lure competitors to the Fort Wayne area a "tortious scheme." The unnamed defendants in the complaint are a group of anonymous online commenters that post on Facebook under the pseudonym Sajin Young "to conceal their online tortious activity," Lutheran Health Network claims. The suit alleges that Bauer either publishes statements as Sajin Young or works with the owner of the account to smear CHS. 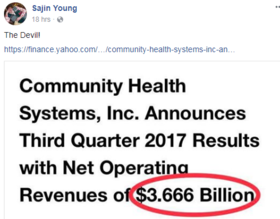 In recent posts, that Facebook account has referred to CHS as "the devil." The scheme, Lutheran Health Network alleges, has disrupted patient, physician and customer relations and is "sowing the seeds of unfounded fear with hospital staff and, no doubt, patients." The complaint also alleges that Bauer fed private information to a group of physicians who have organized themselves as the Northeast Indiana Citizens for Healthcare Excellence, or NICHE, who say their focus is to hold CHS accountable, according to NICHE's website. Lutheran Health Network claims that Bauer marketed himself as a "Fort Wayne insider" with information gathered during his time as the group's CEO in order to obtain his position with IU Health. That includes information on employees and physicians in Fort Wayne, information about insurer and employment contracts in the area and other confidential information. It claims that Bauer has solicited current Lutheran Health Network employees to work for IU Health. IU Health declined to comment because it is not named as a defendant in the lawsuit. Bauer was Lutheran Health Network CEO for two years and Lutheran Hospital CEO for six years. He was fired three weeks after CHS rejected a $2.4 billion offer from a buyout group that disgruntled physicians in Fort Wayne had brought forward to buy the profitable CHS division. More than 100 physicians supported the buyout effort. The CHS board of directors said the offer was at least $1 billion too low and told the physicians not to bring another offer. The group of disgruntled physicians claimed that CHS, the nation's second-largest investor-owned system with 129 hospitals, neglected Lutheran's capital and staffing needs for years and had lost the trust of physicians in Fort Wayne. 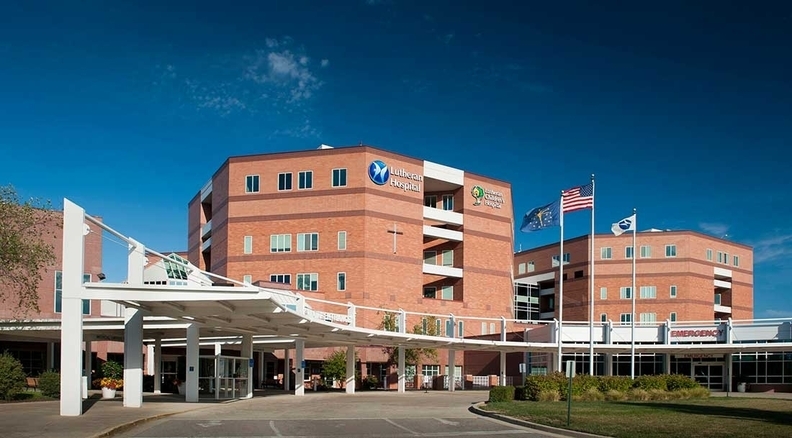 The complaint alleges that the physicians threatened business disruptions if CHS did not sell its Fort Wayne hospitals, and that Bauer encouraged the physicians and supported their efforts. The complaint also states that Bauer drummed up opposition to CHS' $500 million investment in Lutheran Health Network, announced earlier this year.